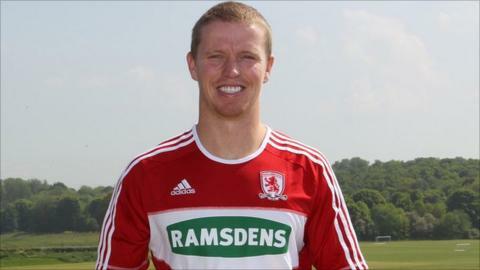 Middlesbrough have signed midfielder Grant Leadbitter on a three-year contract, after his deal expired at Championship rivals Ipswich Town. The Chester-le-Street-born 26-year-old, who began his career at Sunderland, becomes the Teessiders first pre-season signing for boss Tony Mowbray. "I am delighted we have managed to sign a player of Grant's quality, tenacity and competitive edge," Mowbray said. "He is a player who has matured to have a good understanding of the game." Mowbray added: "Following the loss of Barry Robson, he will ensure that we will retain the competitive experience that we need in midfield." Leadbitter made 123 appearances for Sunderland before his switch to Portman Road, where he racked up 14 goals in 126 games before his contract ran out at the end of the season. "I'm pretty excited," Leadbitter said. "I wanted a fresh challenge and when the opportunity to join Middlesbrough came in, I just couldn't turn it down. "I just want to play well for Middlesbrough and get the club in the Premier League."